Why Won't You Grow?! : Take THAT Quikster! We've been Netflix subscribers for around two years now (but really, who can say anymore, as time speeds up as I get older) and we've enjoyed it quite a bit. After we bought a Wii, I eventually hooked onto the streaming service, which the kids (mostly Hannah) also take advantage of on our iPhones. So, when Netflix announced their pricing adjustments two months ago, I wasn't too upset. I knew we wouldn't abandon the service all together. I just wondered if we'd choose to keep the one-physical-disk-at-a-time plan and drop the streaming or commit to streaming only and give up the physical disk. I liked the convenience of streaming and the fact that it carried over to the Wii and our phones and iPad. But the selection was significantly skewed to TV shows only and not as current. The movie selection was decidedly underwhelming. After asking some other people what they were going to do and then thinking about it a bit more, we decided to go full steaming only. I am hoping that as Netflix pushed for more streaming focus, they would use the revenue to improve the streaming library and catch up to more current, just-out-of-the-theater releases. And I also realized that dropping streaming would cut Hannah off from her iPhone/iPad usage of the Netflix app and she would be pretty sad. So, that is where we are now . . . but we've also introduced a new element into the mix. 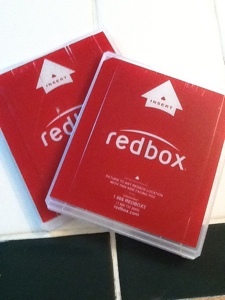 We're adding RedBox to the choices when we want a movie for the kids on Friday nights or when Lynda and I just want to watch something on the spur of the moment. We've found it very convenient, as there are machines all around us and we can search and reserve what we want before we go get it via the iPhone app. Just last night, for instance, we got a movie for the girls to watch and Lynda and I chose Thor. And I'll say that I am increasingly impressed with how Marvel Entertainment has handled their Avengers franchise. If all started with the (mostly) successful Spiderman movies within the last decade to raise the brand to prominence and then really got kick-started with the Iron Man movies. Add in this summer's addition of Thor and Captain America (and the much needed reboot of Hulk--which I haven't seen yet) and it will all mesh into next summers Avengers movie where all of these guys (minus Spidey, I think) will join forces with Sam Jackson's S.H.I.E.L.D. agent Nick Fury to create a hellacious cross-over event that might make Comic-Con explode before next summer arrives. The thing I find most impressive is how Marvel Entertainment has plotted and interconnected each stand-alone film into a piece of the whole, allowing each character to get their focused introductory film while providing bits of inter-connectedness (the ever present S.H.I.E.L.D. agent that pops up in each film along with a teaser scene of Fury after the end credts) to let you know what is being built. And that's even before I mention (and for which I'm sure you already know) that Joss Whedon is prominently involved in the Avengers film. Truly it shall be comic nerd nirvana.